There’s a WWII era slogan “Use it up, wear it out, make it do, or do without!” One sees it a still quoted today in frugalist circles. Between my blog reading and personal experience this last week, I was thinking about the “Make it do or go without” aspect. But both still work. So we’re learning how to make them do. Yes, it would be nice to have a sane VCR, but we don’t think that’d be the best use of our money right now. In fact, this VCR was a gift from my sister who got it from my parents, who did have the money to replace it. We were just excited at the prospect of being able to watch some of our old favorites which haven’t been released yet on DVD. When it comes time to eject them, someone just goes over and holds their hand out to catch the flying tape. It’s like changing the channel before remotes. Is it really so bad if you have to go across the room once in a while? As for my computer, the issue is with the case. As long as it has those two bandages, everything works great 99% of the time (great for my computer, anyway). Sometimes when I’m moving it around, the screen will collapse and cause a headache. But that happens once a week at most. We’ve actually found a solution to the laptop issue. A friend had this same laptop some years back but her hard drive died. So we’re going to try doing a body swap (full backups, of course) and see if that works. Again, a pretty frugal solution. Another thing we could’ve done was look for someone selling this model and bought it for the case (being 5 years old, it should be pretty cheap). Sometimes you can’t do anything but replace the item. Maybe it’s dangerous to leave it as-is. Maybe it really brings down your status in a place where it’s actually important (for example, if I were doing on-site freelancing I should probably have a computer that doesn’t look so sick). Maybe it just plain won’t work. But if it’s still working, perhaps you can make it do without any real suffering. That frees up your money for doing what you really want to with it—paying down debt, building wealth, or buying something else! Can you “make it do” this week? Related reading in the blogosphere: Do you really need it, or just want it?” from Bible Money Matters and Do we really need what we want? by Heather Johnson guest posting at Moolanomy. We are bombarded with images everyday that tell us to replace what they just sold us! The model year phemon…oh your car is a 2002…getting up there huh? Our first instinct is too replace. I have been struggling with my computer as well and have really wanted to replace it, but for what I do with it…it works fine. So i added a bit more RAM and replaced the power supply when it blew, $250 vs $999. This is a great message! We’ve been “making it work” around our house, too. Our sofa leg broke about a year ago. I first propped the sofa up on bricks, but those slid around and stubbed toes. Next, I found some scrap lumber and made my own leg, fastened it to the bottom and it holds together pretty well. It’s a little wobbly, but the idea of dropping several hundred dollars for a new sofa just scares us to death! Funny…my laptop screen is missing a screw so we don’t move it anymore; it’s always open. I’m gonna look into replacing the screw and see if we can get it moving again. I’ve considered replacing the computer but it works and I don’t want to spend the money on a new one. Oh, and the battery only gives like a half-hour of time! But it still works! A lot of times I see a new something or other that I want to get but I come to my senses and realize that what I have is good enough for now. Thanks for the great post – and for linking to my article. I think a lot of times our first impulse is to just replace things when we’ve had them a long time and they aren’t performing as fast as we’d like, or they don’t look nearly as pretty as they used to. I recently had a situation where my digital camera stopped working. The camera is 5 years old, and my first impulse was just to trash it, and buy a brand new camera.. In fact i REALLY wanted to get a new one. Then my guilt got the better of me – i run a personal finance site, I should live by my own advice! Instead of trashing the camera I looked the model up on the manufacturer’s website, found that it had a recall. I sent it in and had it fixed free of charge. Now the camera is as good as new! This is the second time I’ve done that with this same camera – essentially saving myself a couple hundred dollars just by getting it fixed (for free!) instead of buying a new camera. Use it up – make it do! my new motto! I like that background on your computer!!! My laptop was on the rocks a few months ago- turning itself off on a regular basis, amongst other things. Even my computer guru partner said it probably wouldn’t pull through, so I started saving for it’s replacement. I have enough now for a pretty new macbook, but my laptop has revived itself and so I can’t bring myself to replace it while it still works. Sometimes it’s a bit slow and it likes to randomly eject the dvds but I feel compelled to keep it till it dies. At least my laptop fund is continuing to earn interest! I also am obsessive about repairing clothes, small tears, buttons etc. When I saw the picture of you laptop, my first question was, can you get a new case for it? You have the answer yes! Sometimes the ‘disposable’ world wins. I have had two repairs on my car this last half year. Both were, to me, very expensive. Both involved replacing parts of the dashboard. I am not up to taking apart the dashboard! In one case a small part of a electronic display component had failed. Yup they had to replace the whole unit. In the other case it was a control switch that had a bad resister. If I could have removed the part and if the old Radio Shack parts places were around still, I could have replaced the part for less than $10. The actual part ran about $200 for parts plus labor. The first one I mentioned was worse. The entire complex cost about $300. However, they did not have a confirmed part number for it (I checked this with two repair shops) so either I had to leave the car for over a week or they would have to take apart the dash twice. The extra taking apart the dash to find which part went into my car cost $85. I felt burned. I’m fairly old so I remember when we would take the TV to a repair shop and for a reasonable price we cold get it repaired. Individual capacitors, resisters, coils, etc were soldered into place. Vaccuum tubes could be replaced. Today, they are all made as a unit. The upside is we get more for our original purchase price, the downside is that we throw much of it away when it breaks. I’m glad to see there are frugal things people are still able to do. Making it do can be so hard to follow. I love that picture of your laptop. 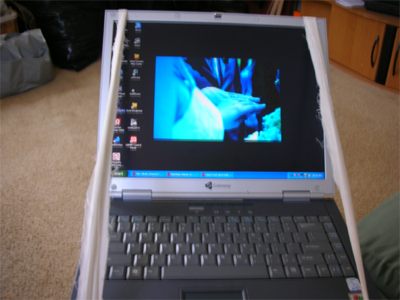 I have a battery that’s shot on my powerbook, but have been “making do” with just using the power cord. I want a new battery, but I rarely use the laptop away from a power source. Great post! Here’s the plan for the VCR: a basketball hoop with a backboard. Connect a plastic or canvas bag to the hoop and position the VCR so that when you press “eject” it shoots the tape at the hoop. Every time it goes in, two points! You could drop 50 cents into a piggy bank for every two points, and sooner or later you’ll have enough to buy a new VCR. It is very refreshing to see a successful blogger with a lap top such as yours. I applaud you for sharing the photo! Today, I threw out an empty butter tub. My frugal blood kicked in, so I dug it out of the trash and washed it out. Surely I can find some use for it. I can “make it do”!